Central Illinois is the summer home for two oriole species, Baltimore (males are bright orange) and Orchard (males are rust orange). They typically arrive in late April or May and stay through mid-late summer. For a 3-4 week period when they are traveling north in the spring, they can be seen both in town and in rural areas. However, they prefer to spend most of the summer breeding season in more rural habitats or along lakes and waterways, ideally with a mix of woodlands or old tree lines and open pasture or grasslands. 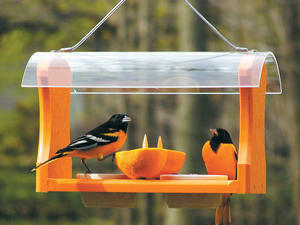 Our most popular feeder allows you to serve orioles' three favorite foods: jelly, mealworms, and fruit. *A note about jellies: While almost any furit flavors can be used, we encourage you to inspect ingredient panels and serve jellies that contain only natural fruit juices and sugars, not corn syrup as a main ingredient. The BirdBerry Jelly we keep in stock contains no corn syrup and gets great reviews from the birds! Jelly dishes come in hanging or pole mount models and can be used for jelly, mealworms, or fruit slices. This is a great, economy priced feeder for when you just aren't sure if you can attract orioles and don't want to make a bigger investment. It is also ideal for serving many other treat foods to other species. An optional rain shield is available. 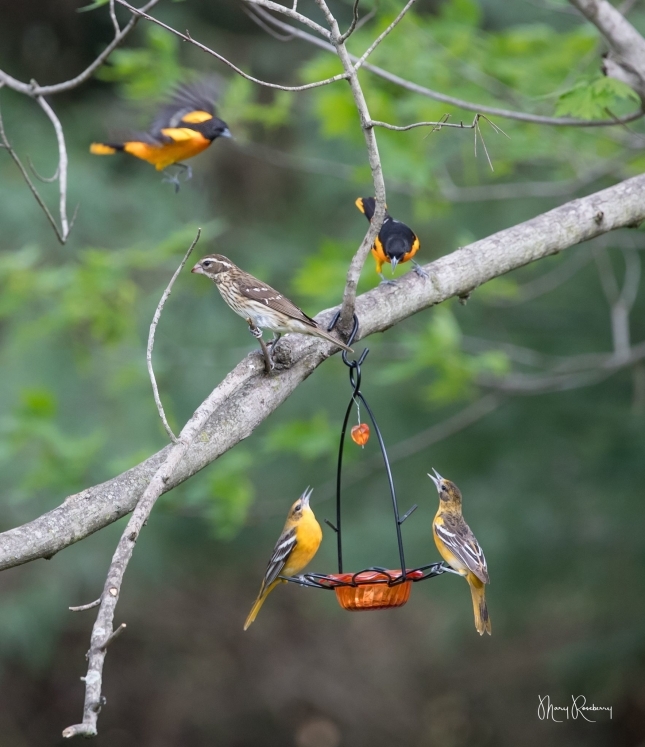 In addition to the jelly and fruit, some orioles like nectar, so this feeder allows you to serve all three. 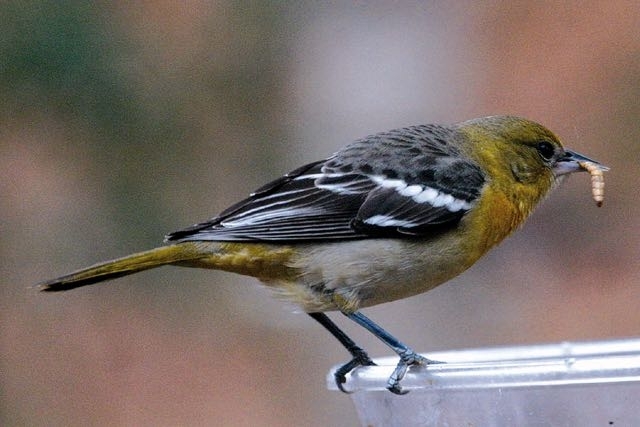 Live insects are the primary food for baby orioles and many customers report the adult Orioles come to feeders even more often if they can carry "take-out" back to the babies in the nest. 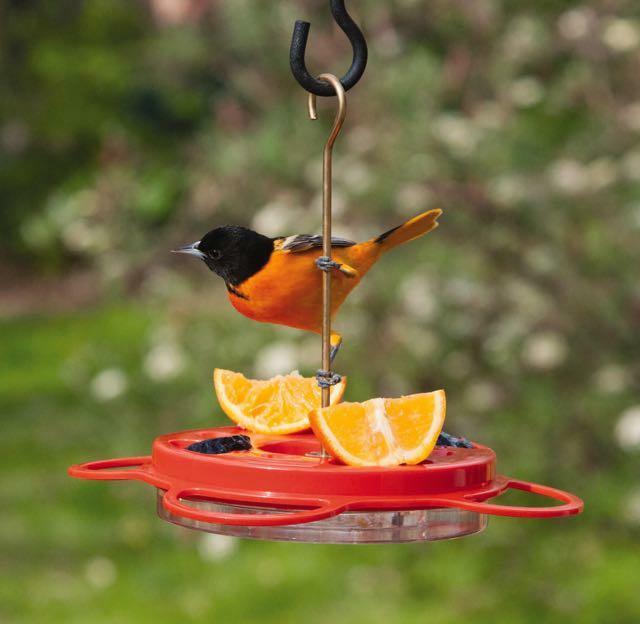 Once you have your oriole feeder, proper placement is important. We find the highest success rate when the feeders are hung from a hook in an open area, rather than in or under a tree. This makes the feeder most visible to the birds. Change the foods and wash feeders 2-3 times a week to keep the feeding station fresh and healthy.